The Third Intermediate Period in Egypt (1076–664 BCE) has been characterised previously by political and social changes based upon the introduction of Libyan social and cultural influences. 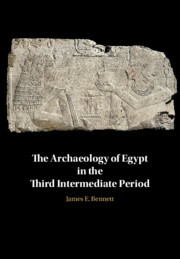 In this book, James Bennett analyses the concepts of 'transition' and 'continuity' within the cultural and societal environment of Egypt during the Third Intermediate Period and provides an up-to-date synthesis of current research on the settlement archaeology of the period. This is done through the assessment of settlement patterns and their development, the built environment of the settlements, and their associated material culture. Through this analysis, Bennett identifies several interconnected themes within the culture and society of the Twenty-First to Twenty-Fifth Dynasties. They are closely related to the political and economic powers of different regions, the nucleation of settlements and people, self-sufficiency at a collective and individual level, defence, both physical and spiritual, regionality in terms of settlement development and material culture, and elite emulation through everyday objects.